How many ways do you like to take your glistening bivalves? 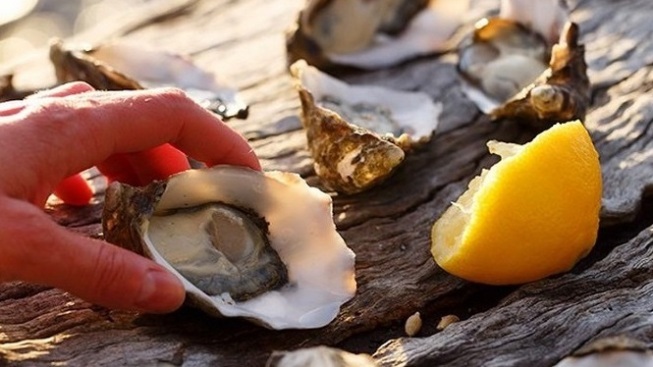 The Central Coast Oyster Festival lines up the juicy fruits of the sea, and lots of lemon halves, too, over the first Saturday in June. ONE CLASSIC, SO MANY WAYS: People who take their scoop of strawberry ice cream without hot fudge or peanuts or whipped cream cannot and should not be argued with: They like their sweet neat, the better to soak up its sugary essence. Likewise, chili enthusiasts are known to refuse the traditional toppings, add-ons like shredded cheese and croutons, the better to dig deeply into all of that savory, oily, meaty goodness. As for oyster aficionados? They, too, can often be found in two camps. You have the slurpers who like the briny bite straight from the ocean, without even a lick of lemon to be found. And then there are those who go for the sprinkles of green onion slices, the chunks of pork belly, the citrus squeezes, the cocktail sauce, and, yes, on occasion, popcorn, too. Neither nosher is wrong in their desires, and both will be heartily welcomed at Avila Beach over the first weekend in June. That's when the Central Coast Oyster Festival rolls out, in all of its glistening glory, but the eat fest isn't just about what's on the half shell; sounds are as important as the shucking, so arrive ready to savor both.